Let the turbines hit the desert floor. Let the turbines hit the... desert floor! 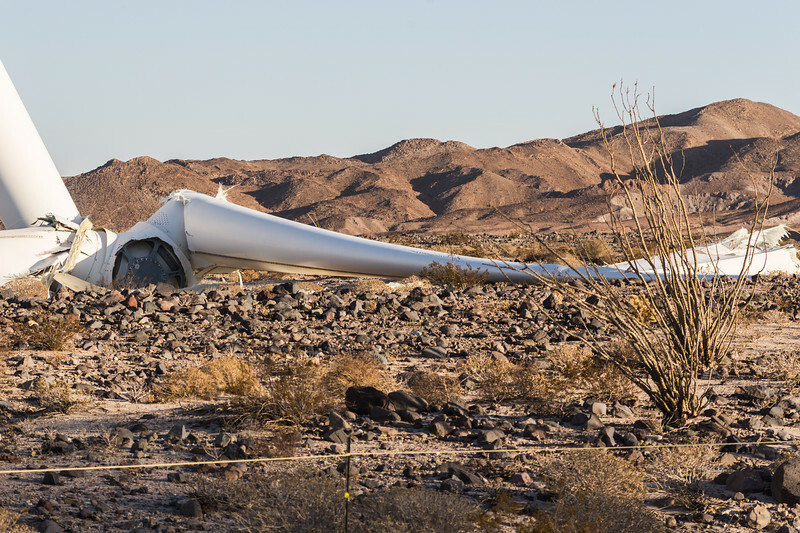 On Monday November 21, 2016 a 500-foot-tall wind turbine at the Ocotillo Wind Energy Facility collapsed in the morning, spewing debris and three blades each weighing many tons across the desert floor. The cause of this failure is still being investigated. Perhaps a blade came loose and struck the tower - causing it to bend? Maybe the transmission/gears suddenly jammed and the force of the spinning blade suddenly stopping was too much for the tower to handle? Note that it was NOT exceptionally windy at the time of the collapse. Also, the tower did NOT bend at a seam.